Happy Leap Day! I was joking with Bookman this morning that anything we do today will have no consequences since the day doesn’t really exist. Now that I think about it though, I wonder if consequences just take longer, like they catch up with you in four years on the next Leap Day? Can you imagine gorging on chocolate and then in four years suddenly not be able to button your pants? Ha! It’s kind of funny but also not. There is a great article at Popular Mechanics of all places about How the Humble Index Card Foresaw the Internet. Did you know the index card was invented by Carl Linnaeus? He came up with the brilliant idea while working on his taxonomies. Then during the French Revolution, French libraries began using index cards to catalog their collections. Of course Melvil Dewey then ran with the idea and used index cards to create a card catalog system that served us well for a very long time. I used to love browsing card catalogs. I am really lucky to have some old cabinets in my house. I use them for storing seed packets, knitting needles, sock yarn, fountain pen ink, hair clips and other odds and ends. I love my card catalog so much! In 1895 two crazy Belgians set out to create their own “search engine” by using an even more detailed system than Dewey’s and millions of index cards that filled 15,ooo catalog drawers. One of the pair, Paul Otlet, wrote a book about the project in 1935 called Monde in which he envisioned all the information one day being digitized because the card database was essentially unsustainable at large scales. And now we have the internet, a ginormous collection of databases and indices, a card catalog of unimaginable proportions. When you consider the internet as something that evolved from index cards it really boggles the mind. I love, love, love index cards even though I hardly use them any longer. I love them so much I want to have a reason to use them but computers are so darn handy these days I go digital before I consider analog. But I keep a stash ready for when a project comes up that begs to be organized on index cards rather than my computer. One of these days there will be something and Bookman will come home to find the living room floor covered in cards and me happily shuffling them around while humming a happy song. I’ll never forget those card catalogues. They served me well for a very long time and they often sent me into the stacks to look for the books related to my search. Up there into the stacks was even better that the catalogue itself. Book after book unrelated or only partially related to my search. Remember how often the book wasn’t there? And remember how often you returned with a book that was even better than the one you were searching for? Honestly I haven’t been to the library in a very long time and that isn’t a good thing. I do like index cards for shuffling around! When I’m stuck on a writing project, I’ll sometimes write the different bits on index cards and put them on the floor and move them all around. It helps organize my thoughts a little bit! It can be just really salutary to have something to look at and touch, instead of everything being on the computer. Jenny, being able to touch and move a things around, to see it in front of you instead of abstracted on a screen can make a huge difference and I am pretty sure it allows for some leaps of thought and connections that would not have happened otherwise. cirtnecce, when I was a student I used index cards for organizing my papers. I even wrote my master’s thesis using piles of index cards. Hey, those cabinets are pretty handy for keeping little things! 🙂 I have more drawers than I know what to do with though sometimes I imagine filling them up with index cards that have research notes on them. Research for what I have no idea but I like the thought. Card indexes used to have a (strange, bookish) glamour to them and I understand your affection for them. Waldo is in some sort of paradise in your picture! Ian, bookish glamour, yes I like that! Definitely magical memories attached to them for me. Waldo has a tendency to think that every piece of furniture in the house is there just for him and since the catalog is so much taller than everything else, he especially enjoys perching on top of it to survey his domain. Deepika, Waldo and Dickens both have it pretty hard 😉 If only humans could have such pampered lives! I still have some information on cards, and turn to it when needed. Another use for the cabinets is to store the old sound-cassettes, should you still have something to play them on. Or Video-8, if anyone can remember those! Oh yes, but I have those too – just can’t bear to throw anything away…. I still love filing cards and use them whenever I have something of any length to write. I put each idea that I want to include on a separate card and then throw them all over the carpet. Then I play around with them until I have an order that is elegant and includes them all. I know that in theory I could do something similar on the computer but it doesn’t have that same tactile element that seems to be essential for me to order my thoughts successfully. Alex, there is something to be said for being able to physically manipulate the cards in front of you. Sometimes all the cutting and pasting on a computer outline jumbles things up so badly it’s hard to figure anything out. 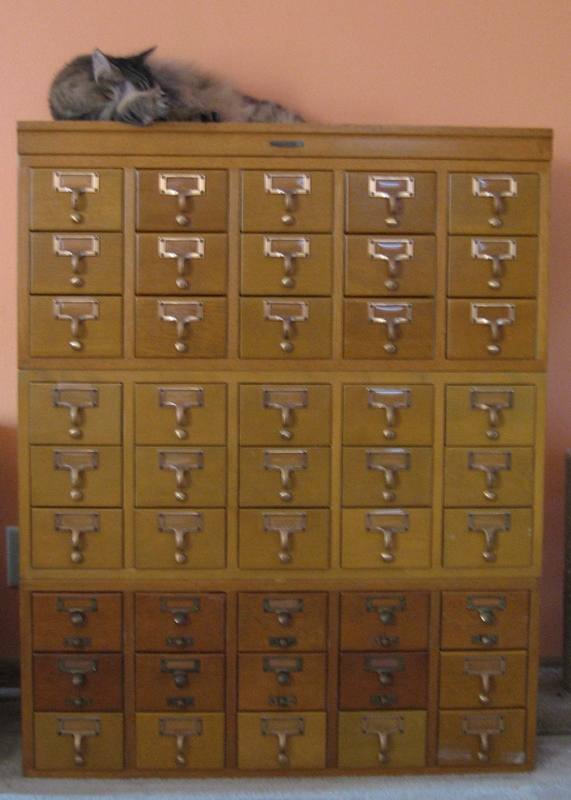 I love your index drawers, they take me right back. The only thing better than browsing in them was browsing in the reserve stock in the basement, where only the library staff were allowed to go. There were all sorts of out of print treasures down there. I worked in that library, way back when everything was paper based and I could find the readers’ tickets faster than a computer can work! Oh my gosh I need a card catalog!!! How awesome! I could put so many little things in it–knitting needles is a great idea; I need a better way to organize mine anyway. Also I could use it for sewing supplies and office/writing supplies (not to mention a cat perch–how cute your photo is!–and the literary link makes it extra special). You are officially a genius! Sarrah, I was very lucky to get it. One of the small university libraries found several in their basement a few years ago and “auctioned” them off to the library staff via email. You had to be able to haul them away and the colors were mismatched and they definitely look used. But I didn’t care, it was an opportunity not to be missed and since they are solid wood I could always strip them and restain them but I kind of like their beat up mismatched looked. Oh yes, they are great for sewing supplies too. I have a drawer full of random buttons I forgot to mention and spools of thread and one stuffed with post-it notes and another filled with my bookmark collection. Very handy these drawers! Decades ago I kept track of my work with a “Ticker system” consisting of tabbed cards of Month names and several sets of cards numbered 1-31. When something was due down the line, I would write on a card numbered with the day, and store it behind the apprpriate month tab. Every day the cards were pulled for that day, the file pulled, the card placed on the desk with the file, the task completed. Simplicity at work. Today it’s all computerized…except for me. “They” almost miss deadlines and look harried; I sleep at night. I love cards. Oh Grad, so very organized! And hey, If your system works, why change it! Plus you don;t have to worry about computer crashes and losing data. I’m both digital and analog when it comes to record keeping for books. Since the 1960s, I’ve kept summaries of the books I’ve read on 3 x 5 cards. I don’t remember where I kept these before I bought my old two-drawer oak card catalog box. That’s where the 3 x 5 cards live now. But I also input the title, author, and date read of all the index cards on a Filemaker list I created. When I finish a book, I still do a recap on the 3 x 5s, but I add the title, author, and date read to my digital file. I also created a digital list for the books on my Kindle. And I’m about to create a digital list of books I want to read. I discovered that I can put the list documents on my Kindle, so I can take them with me. I know, I know. All these lists say something about me! But I love card catalogs most! Joan, as someone who loves lists, I do not criticize your list-keeping 🙂 Before computers and libraries with wishlists, my TBR was a shoe box full of scrap paper I’d write book titles on 🙂 You two-drawer card box sounds lovely and well used! I think your Leap Year observation is actually really amusing. Good thing I didn’t do my taxes then as I would hate to have to wait four years to actually get the money! I wish I had a card catalog at home–the physical object–It would be perfect for my needlework supplies, to say nothing of just looking really cool. I didn’t know the Linnaeus angle, but I am not at all surprised! Danielle, oh how terrible would that be? To have your taxes done on 2/29 and have to wait four years for a refund! But if you had to pay something, that might not be so bad 😉 Goodness yes, a card catalog would be a perfect storage place for all your stitching supplies! I didn’t know about Linnaeus either, I always assume index cards were a fairly recent thing so it was kind of neat to learn how long they have been around.